Have you ever watched these TV talent shows, like The X Factor, and wondered who has told the really awful singers that they are good? Feeding their fantasy of sounding like an angel when they sound more like a drain, only to be publically humiliated in the process? This is not a new phenomenon. 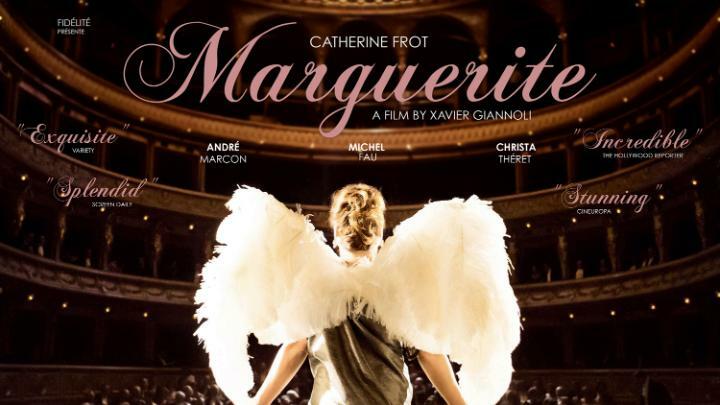 In fact, this year we are going to see two films about that self-same subject, Starting off with Marguerite, a French comedy drama that is full of class and style but whose voice is appalling. Marguerite Dumont is a sophisticated lady who has everything. A devoted husband, a huge house and a very protective butler. She’s a music lover, especially for opera. Leading a musical society at her mansion, she has become the star performer. The only trouble is, she cannot sing at all, yet no one has the heart to tell her. This only feeds to her fantasy as she dreams of doing a public performance. So she hires a fading opera singer to train her. Already a huge hit in France, this is inspired by the life of Florence Foster Jenkins, a woman who took bad singing to new heights and the subject of a new Meryl Streep film later this year. Director and writer Xavier Giannoli have produced a gloriously beautiful film, capturing the high-class lifestyle of 20’s France with style and grace. He takes his time, allowing his main characters to grow and so we have an understanding of why the people surrounding Marguerite’s life would let this farce continue. There’s plenty to enjoy here. The film oozes class with its high production designs and the plot moves along gentle, introducing a group of interesting and diverse characters. Where the film suffers is that these characters are never given subplots that amount to very little. A blossoming romance between a radical reporter and a up-and-coming young singer doesn’t go anywhere and seems to fizzle out and is forgotten way before the film ends. Even the relationship between Marguerite’s long-suffering husband doesn’t really take hold until Marguerite’s decision to go public. Yet there is comedy here. Marguerite’s protective butler, forced to photograph the lady in some of the most famous operatic diva roles is joyful, while he refuses anyone to say a bad word about her, has a sweet nature about it. It’s all played with charm and grace and while you aren’t busting a gut from the hilarity, it has the same tones and beats of something like The Lady in The Van. This is helped by a delightful lead performance from Catherine Frot. She manages to make an egomaniac woman have plenty of likeability. You genuinely feel sorry for her that she cannot hear just how bad she is when she opens her mouth and when the final reel arrives, you completely sympathise with her, amounting to a heartbreakingly moving finale. The rest of the cast, no matter how sketchy their characters, all do sterling jobs. At just over two hours, the film is far too long and is flabby at best in the middle section, yet it has enough charm and wit to keep you watching while you wait patiently for Marguerite to open her mouth once more. Far from perfect but still a delightfully fun French film.